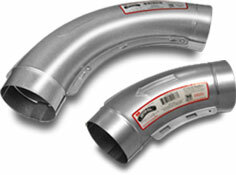 Longer radius and smooth interior increases airflow efficiency. Underwritings Laboratories prepared a fact find report which shows, among other findings, that Dryer-Ells are 500% more airflow efficient than sectioned, small radius elbows. From a volumetric air flowrate standpoint, Underwriters Laboratories' fact finding study shows a dramatic improvement when using the new long-turn dryer venting elbow versus a typical sectioned duct elbow. One of the findings is that it takes six LT90s to affect flowrate as much as a single sectioned elbow does. Further, the study found the actual effect of sectioned dryer elbows is equivalent to 15 feet of straight pipe.